2019 Apple Festivals in West Virginia - Where, When and More to Find an Apple Festival Near You! Looking for a apple festival in West Virginia in 2019? (just scroll down the page)There is no other listing as complete and current as this list, just updated! 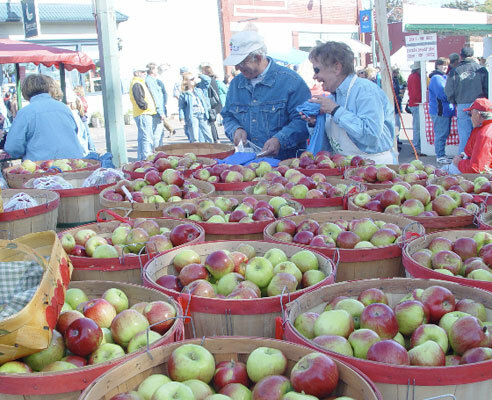 All the apple festivals in West Virginia we can find are listed on this page! If you love strawberries, look for a festival near you below! And I'm always looking for more apple festivals! Please write me, if you know of any to add! I update the dates as soon as the festivals publish their information, but you can always click on the links (usually the name of the festival) to see the current information on the festival's own website. I update this list every year, but still click on the links to the festival (the blue, underlined name of the each festival) to confirm this year's dates on the website for each festival. They may change or cancel at the last minute. . If they don't have a website, call the phone number provided, but ALWAYS CONFIRM THIS YEAR'S DATES AND TIMES BY EITHER VIEWING THEIR WEBSITE OR CALLING. Click here for the form to add a festival and have detailed information; or click here if you have general information and are not connected with the event! Apples typically ripen from July (yes, some early varieties start then, especially in southern areas) through early November. Most apple varieties ripen in Spetember and October and this is when most apple festivals are held. Unlike strawberries, which grow almost anywhere, apples are grown commercially in half as many states. They do not grow well in very warm climates, like Florida, and along the Gulf coast, etc. Apples require a certain number of hours of cold (below 40 F) in order to produce fruit. So most commercial apple production and apple festivals are north of Interstate 20 (I-20). Following the festival listings are links to our easy to follow directions about making apple jam, freezing apples, apple pies and much more. Apple Butter Festival - early October. and Small Engine Show, 11:00 am Chicken Barbeque, 12:00 pm Fiddle, Banjo, Mandolin - Adult & Senior Divisions. ABSOLUTELY NO PETS (Service animals permitted). 304 Fairfax Street, Berkeley Springs, WV 25411. Phone: 304-258-3738. Email: [email protected]. The 30th annual Apple Butter Festival is a traditional fall harvest celebration. It fills the streets and park of the historic town of Berkeley Springs with apple butter made in copper kettles you can stir, more than 200 vendors of food, art, crafts and produce; music from the bandstand, games & contests. Wetzel County 4-H Campgrounds, New Martinsville, WV. Event dates: mid-October. Directions: 2 miles east of New Martinsville on Route 7. Anyone know more about this one? Clay County Golden Delicious Festival - mid-September: September 18-21, 2008; September 17-20, 2009; September 16-19, 2010. PO Box 416, Clay, WV 25043. Phone: 304-587-4455 (William Dunn). Email: [email protected]. Chili Cook-Off-Sunday September 18th: Best Chili wins $1000.00. Schedule of events. Recognizes Clay county as the birthplace of the Golden Delicious apple. Parades, fireworks, music, archery shoot, chili cook-off, ox roast, baking contests, outdoor drama, ox roast, baking contests, outdoor drama, bike trek, apple butter making, duck race, bingo, amusement rides, quilt show! Fireworks Great Family Entertainment, And don't miss the coronation of Queen Pomona XXVI! See the Schedule of Events. For more than 25 years, the Mountain Sate Apple Harvest Festival has celebrated the rich agricultural heritage of this part of West Virginia, highlighting the role of the apple in that tradition. In addition to community and church festivals, some private farms have their own apple festivals. See each farm for this year's dates (they often do not announce them until the end of May). They usually have PYO apples then, too. Also, scroll down to see the links to recipes, freezing, canning and jam making directions at the bottom of the page. We will be adding these as we find them; Please write me, if you know of any to add! How to make a pumpkin pie from a fresh whole pumpkin! Apple crunch - best of all! Moist, low sugar and using oats! For other fruit and vegetable festivals, see this page!